Big party? Lots of credit cards from lots of people? Why bother with a calculator and all that division. Just use the Check Please application. 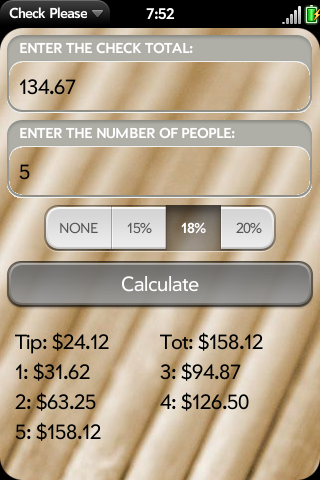 Not only does it easily calculate the tip, it makes splitting the bill a snap. Just enter the check total, the amount your party wants to tip and the number of peopled in your party. Viola! It calculates how much to put on each card.